Emma and Patrick worked their way through the Helambu valley. 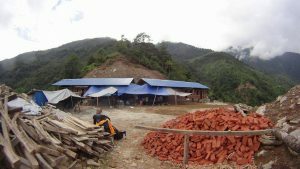 In this blog, they talk about their trip through the hills, from Pading Village to Dabchung Village. If you’ve missed it, catch up on Part 1 of their story. Revitalised after a bowl of deliciously spicy noodles at the home of Pading SMC chair, Ganesh Tamang, we began the next leg of our journey to Dabchung, guided by Sancha Tamang, the chairperson of the school there, whose family would be our hosts that night. Dabchung is a village perched high on the hill opposite Pading, and for Dabchung’s older pupils the perilous walk to Pading’s larger school is a daily challenge. 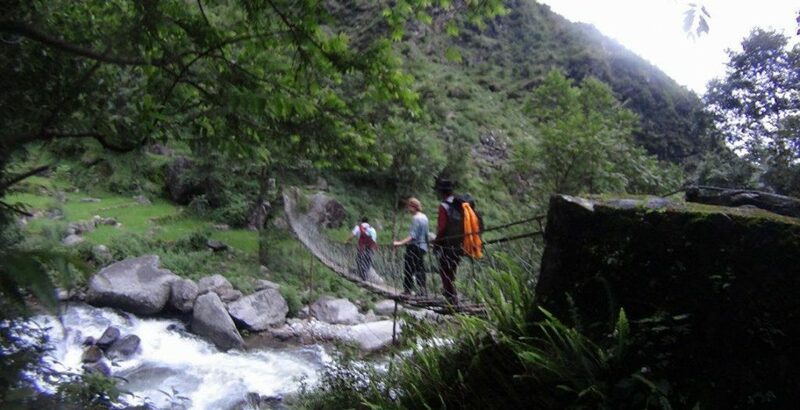 We all fell over at least once on the steep and slippery path downhill to the swollen river, which we crossed by a quite frankly dangerous bridge. Our legs wobbly with fatigue from the treacherous descent we took a quick break before beginning the equally arduous uphill slog to the village as darkness descended. After an hour and a half we three weary travellers were sat down and treated to tea and roasted corn straight from the fire by the locals, before the final half-hour through the village by torch-light. Welcomed warmly by our host family and relieved to have finally reached our destination, we had a wash under the refreshingly cold outside tap and were sat down on woven bats on the clay floor around the open fire with the family, for a dinner of buff, dal bhat and raksi (a locally distilled millet drink) while we talked and laughed until our eyes were closing. We were given our own comfortable room with beds and blankets and were so glad to finally rest our weary bodies. Early the next morning, we visited the little school to find around twenty local men already hard at work on the retaining wall below the new school. Some were doing basic labour, carrying hunks of stone on their backs who were meticulously assembling the wall from these stone slabs and sand. This wall should protect the building from landslides; we had seen the unfortunate fate of the previous school, still a pile of rubble in the middle of the village, last night. It was great to see the local people, rather than outside contractors, working on the site. Through this building, they are learning invaluable skills that can be applied to the building of their own, and their neighbours’ structurally secure houses in the village. It also creates a sense of ownership in these fathers and mothers, empowering them to ensure their children receive the education that many of them didn’t. The school’s three classrooms, for children aged five to eight, were almost finished, with just partitioning between rooms and levelling out front to be completed. There was still quite a lot of work to be done on the toilet block’s roof and plumbing, the playground was still being cleared of boulders, and the gate and fence are still absent. It’s hard to imagine a school in a more idyllic location. From the site there is the most spectacular view of the hills rising from the zig-zag valley below, the sparkling river snaking its way through the middle. As we left Dabchang, we walked past the TLCs where the children were hard at work in class, with their Mondo/HELP-sponsored teacher. 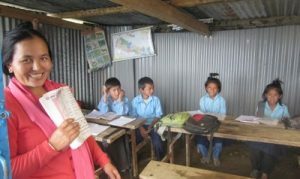 While these Temporary Learning Centres sprung up amazingly fast after the earthquake, and have provided an excellent means of education in a time of need, they, with their tarpaulin walls and corrugated iron roofs, are by no means suitable as permanent establishments. Seeing classes here in full swing made us realise the immense importance of new, strong, secure schools being built around Helambu.